The Corporation continues to insist that 29% of users who use Windows XP worldwide have not so much time to migrate to new versions of OS. At the same time, partners of MS received direct instructions from the corporation – to apply any possible efforts to prompt users to stop usage of Windows XP. Nevertheless, many people who for various reasons cannot or do not want to migrate to the new operating systems, continue to ask important questions concerning the future of 12-year-old operating system. For example, will Microsoft provide users with access to a free antivirus product Microsoft Security Essentials after April 8? According to the corporation after April 8 any kind of support of Windows XP, including antivirus solution Microsoft Security Essentials, will stop completely. Windows 7 was presented in 2009, and some components contained the name “XP Mode”. This mode allowed the user to work with the application and programs designed for Windows XP. After April 8, the corporation will stop supporting these components as well. According to the press secretary of the company, as the development of updates for Windows XP will be stopped, these components will be potentially unsafe. Despite the claims of a complete stop of support of Windows XP, the company informed that after April 8 2014, outdated operating system can be installed and activated. “Computers that are running Windows XP will continue to work, they just will not get security updates and will expose users to various risks,” – said the rep of Microsoft. Microsoft extended of the release of the updates for Security Essentials for Windows XP. Despite the extension of the release of updates, the program can no longer be downloaded since April this year. Microsoft has announced its intention to extend the release of updates for its antivirus solutions Security Essentials for Windows XP until April 15, 2015. We remind you that the company will discontinue support for the Windows XP after April 8 this year. There have been a lot of assumptions lately about the update release. In October last year, representatives of the technology giant reported edition ZDNet, that “corporation does not guarantee the update release for antivirus solutions support for Windows XP after April 8, 2014.” Also, there were rumors that Microsoft will stop the update release, but the company has never claimed this. XP users can also install anti-virus products of other manufacturers, who will receive information from Microsoft about this OS, at least for one year. 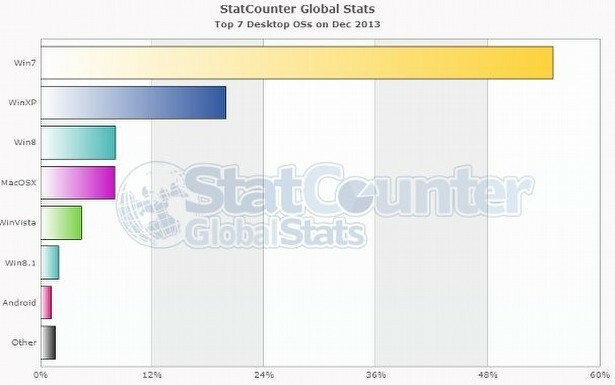 Windows XP is still the second most popular OS with 18.53% of users. The company has made great efforts to convince users of the Windows XP to upgrade to new versions of the platform. However, users are not yet ready to abandon the 12-year-old OS. This is confirmed by the statistical data collected by analyst company StatCounter. Despite the fact that a number of users of the outdated OS decreases, not so many people actually migrate to Windows 7 or 8. On December 21, 2013 Windows XP is still the second most popular platform (it is used by 18.53% of users) after Windows 7 (51.3%) and only 7.54% of users prefer to work with Windows 8 and it is only a third place in list. From this we can conclude that Windows XP users are moving not to the newest version of the OS but to the previous build – Windows 7. Mac OS X has almost the same result similar to Windows 8. The operating system from Apple has 7.39% of users. Other platforms have the following results: IOS – 4.81% of users, Windows Vista – 4,05% and Android – 2,59%.